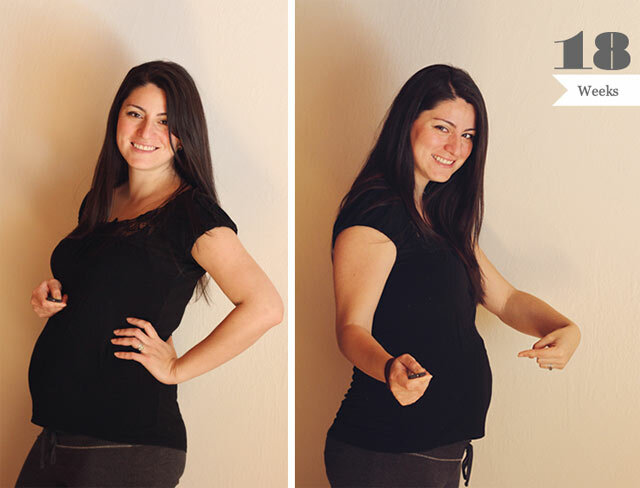 Before I share the post I have for today I wanted to thank everyone for the response on Facebook, Twitter and the post where we shared the news of our little one on the way! We are so excited and it feels so awesome to feel the love from all of you, you guys are amazing and I feel so lucky that you all read and follow my online adventures. 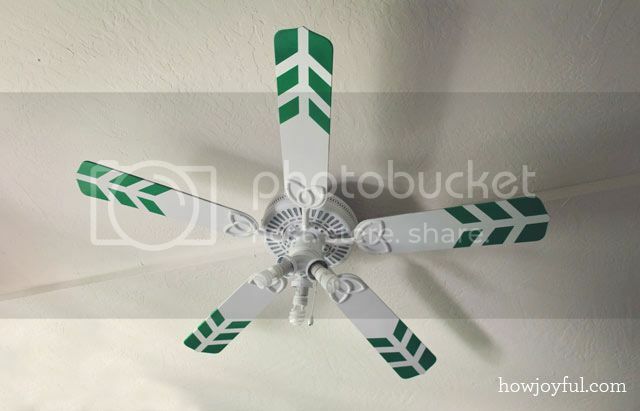 For today I want to share an update I did on the fan of the sewing room, I was super inspired when I saw a chevron project posted on Design Sponge last year, I pinned it with the hope that someday when we had a house of our own I could refurbish my own. Since we are on a very tight budget for all of our house improvement projects we are going to refurbish a lot of the things that were in the house, in the case of my office/sewing room I already showed you what I did with the build-up, now it's the time for the fan! In my case I needed a full recovery for this fan because I didn't like anything about it, as you can see in the before picture, it had flower shape lights, the blades were showing the wicked pattern side, and I definitely didn't like the brass body. So I took the blades out and I was super happy to find that the other side was plain wood, so I would paint and accomplish my idea on that side. For the body, I left it there and took the flower glass shared off (I need to figure what i will replace them for later) I taped and cover around the areas I didn't want painted and spay with a metal primer, then top it with white paint. I did the same for the metal parts of the blade and use wood paint for the blades. After that I taped the shapes I wanted on the blades, this was my very first experience with frog tape, I totally loved it but I did a few things wrong on this try. I was not sure of how much pressure I should apply to the tape, and I had a few areas where tape crossed, so my advice pay extra attention to those areas, use your finger and really press there, I didn't and my blades got pretty messy in the crossed tape areas. I am really excited because I only have a few more projects to finish the sewing room of my studio, after that I plan on finishing the office room to get all done with my Studio level of the house, that way I can focus on the re-launch of my site and the projects for the baby's room =] Hopefully I will get to it in a couple of months. Looks gorgeous! 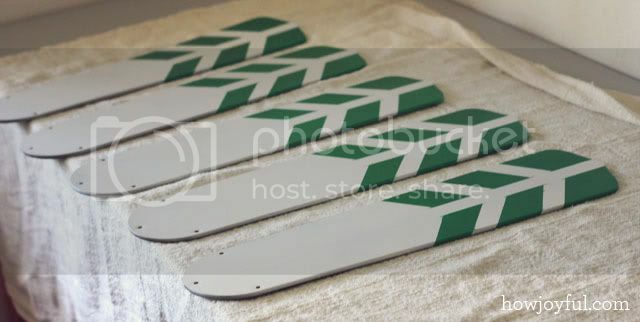 I bet it makes a neat green stripe when it’s going! It’s make a new ceiling fan! So beautiful!!! Like a garden!!! And again, congratulations for the baby!!! I will ready aaallll the new blog. bendiciones a la mamá y el/la bebé!!! 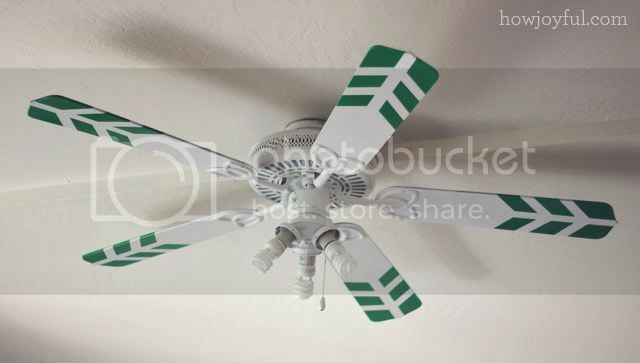 This is really neat, I’ve been meaning to do something with the fan in my room but my dad warned against it because he said too much paint can throw the fan off balance. Have you had any problems with that? Thank God I found you!! We just recently bought a home that is happy 80s and 90s. The ceiling fans are GOLD!!!!!!!!!!!! AAAAAAAAAAAAAHHHHHHHHHHHHHHHHH!!!!!!!!!!!!!! We cannot in no way shape or form afford to replace 7 ceiling fans!! I cannot wait to paint them all and also cannot wait to hear of your future endeavors! Oh I just can’t wait!!!! Did you paint the motor part while it was attached to the ceiling? Didn’t paint go everywhere? 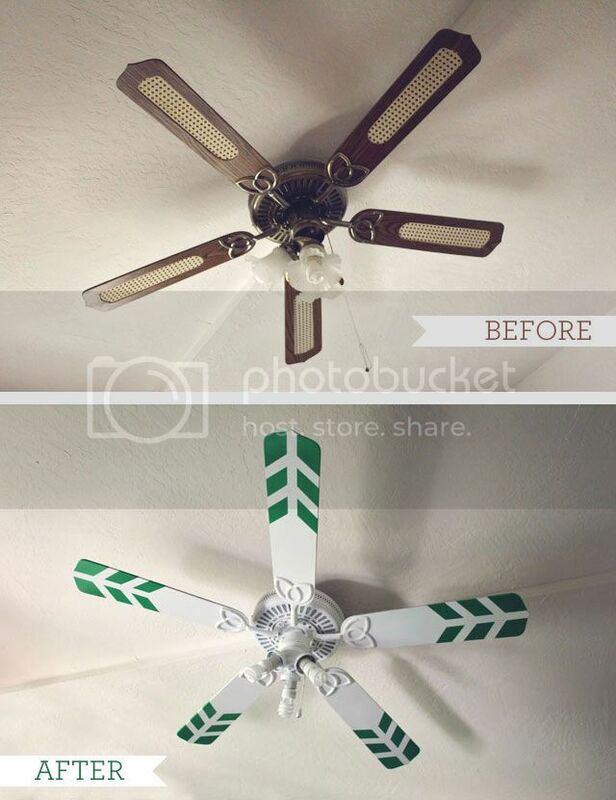 Well done on your ceiling fan – it looks great! 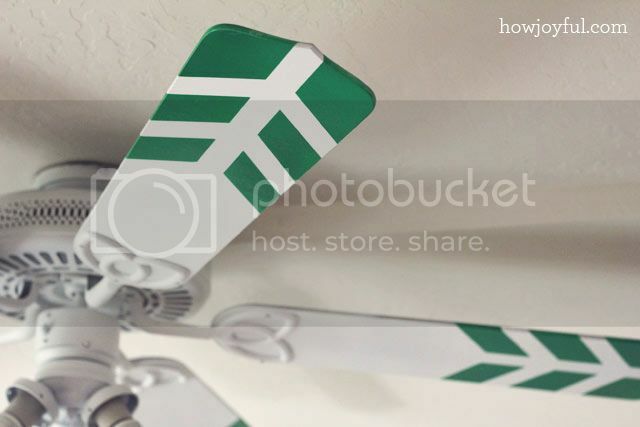 I’ve got this linked to my ceiling fans roundup post as well today, for inspiration! Love your blog too, glad I found you and will follow! !